Cowes Sailability Club aims will be once again making it possible for disabled people and their families or carers to experience the thrill of a world-class sailing regatta from the water during Cowes Week. For the sixth consecutive year Cowes Sailability Club have chartered Wetwheels for five days over Cowes Week. “Often, people with disabilities are unable to really appreciate large events like Cowes Week because of the crowds and the lack of accessible facilities. 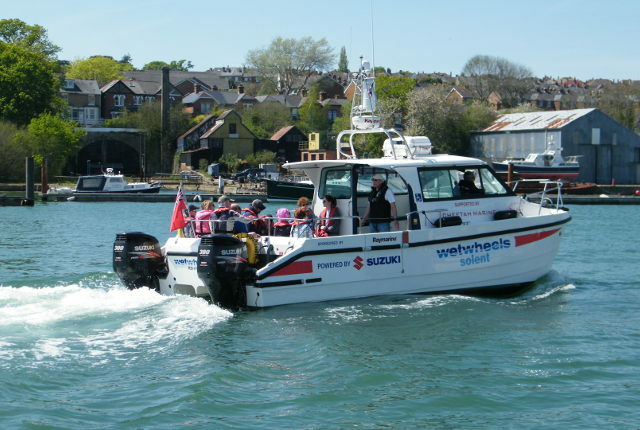 Wetwheels Solent is a nine-metre catamaran that can accommodate up to three wheelchair users at any one time. The vessel has been made available to Cowes Sailability Club for Cowes Week by the Wetwheels Solent CIC, through the generous support of the quadriplegic yachtsman Geoff Holt MBE DL.